A private detective who worked for the Costa Mesa Police Association pleaded guilty Wednesday to multiple felony charges related to his plot to get the city's mayor arrested for driving under the influence of alcohol. Christopher Joseph Lanzillo, a former Riverside police officer, copped to false imprisonment and conspiracy to file a false police report. The 46-year-old Lake Arrowhead resident faces up to four years and four months in state prison at sentencing scheduled for Jan. 13 which, unfortunately for him, is a Friday. He could also lose his P.I. license. 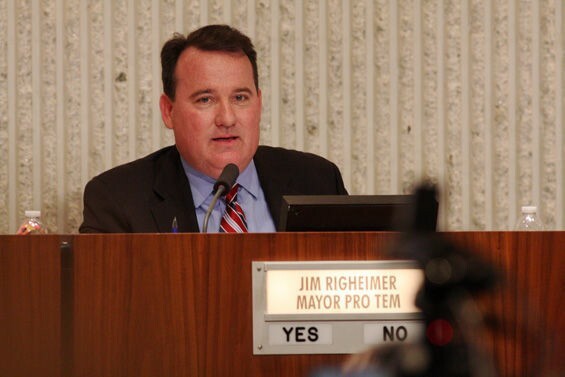 Gary Monahan, Steve Mensinger and then-Mayor Jim Righeimer represented a Costa Mesa City Council majority in 2012 that the Costa Mesa Police Association considered hostile during contract negotiations in the months leading up to November 2012 city elections because they favored reining in pension costs. Lanzillo worked as an investigator for now-defunct Upland law firm Lackie, Dammeier, McGill, and Ethir, which the Costa Mesa cop union hired to conduct “candidate research,” including surveillance of Monahan, Mensinger and Righeimer. On Aug. 22, 2012, at Skosh Monahan’s restaurant, which is owned by Monahan, Lanzillo’s partner Scott Alan Impola, who was also a former Riverside police officer, observed Righeimer drinking a couple of dark-colored beverages before leaving and getting into his black Yukon to drive home around 5:45 p.m.
Lanzillo, who was part of a cell phone texting loop with Impola and cop union law firm partner Dieter Dammeier, called 9-1-1 to falsely report he saw a man stumble out of Skosh Monahan's and get into a black Yukon, which Lanzillo followed and claimed to see swerve on the road as if the driver were under the influence of alcohol or disabled. Lanzillo told a Costa Mesa police dispatcher that he followed the Yukon to a home, giving Righeimer's address. With Lanzillo watching from his parked white SUV, the councilman was briefly detained outside his home during the DUI investigation. But Righeimer passed a sobriety test and was determined to not be under the influence because he'd only consumed Diet Cokes, not alcohol, at Skosh Monahan's. Lanzillo later admitted during questioning that Righeimer did not stumble out of the bar and was not swerving when he drove. Righeimer immediately went public with accusations that he was put under surveillance by the police union, which claimed the elected official was paranoid. Lanzillo originally pleaded not guilty in the case at Orange County Superior Court in Santa Ana, but he later added to four felony counts tied to the false DUI report against Righeimer as well as the illegal use of GPS tracking devices to tail current Costa Mesa Mayor Mensinger and an attorney at a rival law firm. Impola, 48, of Canyon Lake, faces the same charges at his trial scheduled to being March 15 in Santa Ana.